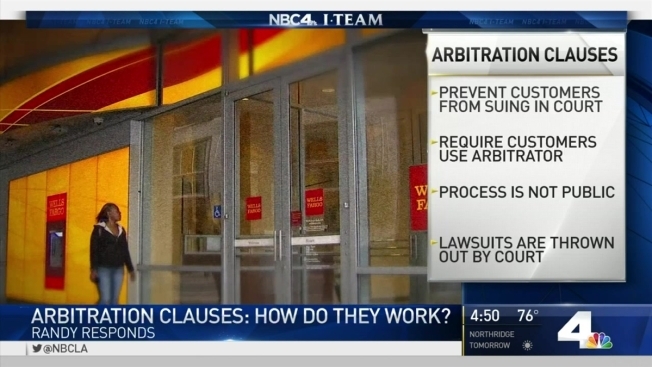 How Do Arbitration Clauses Work? The Wells Fargo scandal continuous to grow two weeks after the company was fined by the federal government for allegedly illegally opening 2 million unauthorized accounts for its customers in order to meet aggressive sales goals. That resulted in a $100 million fine, the largest ever issued by the Consumer Financial Protection Bureau. Over the last five years customers have sued Wells Fargo over those practices. But those cases were thrown out by the courts because of arbitration agreements. Arbitration agreements can be a big problem for consumers. You know all those forms you sign when you open an account to buy a car or sign up for cable service? Almost all of them now have arbitration clauses in them, which means you're not allowed to sue the company. Instead, the company has hired an arbitration company to handle their disputes and the whole process is top secret. If you try to sue, like several Wells Fargo customers did, it gets thrown out by the court. Consumer attorneys say it's one of the biggest inequalities for consumers today. Why Do Cellphone Batteries Explode? If it's a smaller company, demand they remove it from the agreement. Sometimes they will. If arbitration is mandatory, research the arbitrator before you sign. Some have better reputations than others. Check to see if you're allowed to go to small claims court. Most big companies will let you handle smaller cases in small claims. In California, that could cover you up to $10,000. Doing these things could protect you if the company wrongs you. As for Wells Fargo, it has apologized and pledged to make changes to its business.